In today’s economic climate, most families live under a pretty strict budget. Family budgets help everyone make priorities, set boundaries and become fiscally responsible. Whether your family is has two children or two grey hounds, you define your own family and budget. What better way to celebrate the freedom of choice than to buy a new car online? Keeping your needs and values your own, shopping and purchasing your next car online is the smartest way to keep your budget in check without feeling pressured into a different vehicle. You made your budget, now you make the choices. Below is a list of the most affordable midsize SUVs offered for 2016. Each coming in under $40,000, they provide the cargo and passenger space that we expect with SUVs without breaking our family friendly budget. Safety and comfort and quality taking top priority, you’ll find the value in each of these midsize SUVs. With a car-like drive, the 2016 Honda Pilot is fully redesigned for this model year. Offering third row seating, plush interior and with the Honda name, buyers can count on reliability for years to come. Even adults will find comfort sitting in all three rows, though maybe longer journeys don’t include third row passengers. A powerful V6 comes standard in the Pilot that is mated to a six-speed transmission although a more superior nine-speed transmission is optional in higher trims. Fuel economy is top notch for a third row SUV, offering 19/27 mpg city/highway. With enough trims and options to pick exactly what you want, the Pilot is initial offered at $29,995 - $46,420. Offering three rows in the 2016 Santa Fe, or two rows in a turbocharged Sport, Hyundai is showing off and showing up delivering exactly what people are asking for: top quality, high performance and premium amenities. With both models mated to a 6-speed transmission, the Sport offers an optional, livelier turbocharged engine while the three-row Santa Fe comes standard with a V6. Both Sport and Santa Fe provide adequate and comparative fuel economy for three and two row SUVs, but neither are outstanding. Attractive and quiet cabins, passengers and drivers alike will appreciate the comfort, handling and supportive nature of the driving and riding experience. 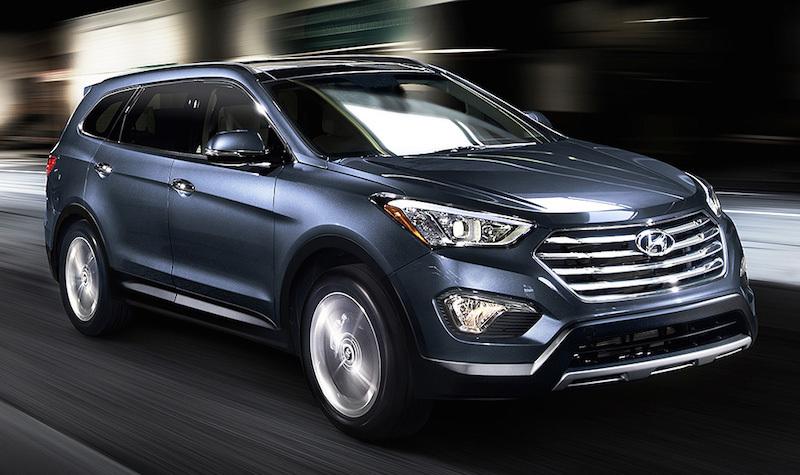 Hyundai has priced the Santa Fe comfortably to fit in your budget and lifestyle starting at $30,400 - $36,250. Offering some of the best fuel economy in its segment, which is already competitive enough, the 2016 Kia Sorento also provides the best looking cabin in quality with premium materials abound. Panoramic sunroof, proximity key and 10-speaker Infinity audio surround sound system are just some of the appointments that let you believe you’ve moved into the luxury segment without having paid for it. What it offers in appointments it matched in cargo space. Providing more cargo space than most in its class, the Sorento offers extra cargo room even with the third row up. Generating enough power even with the standard 4 cylinder engine, Kia offers a turbocharged choice along with a V6. It’s fuel economy is 21/29 mpg city/highway. Responsive handling and steering have been improved for this model year which heightens its performance and drive quality. A whole host of trims and options allow you to personalize your own Sorento starting from $24,900 - $43,100.